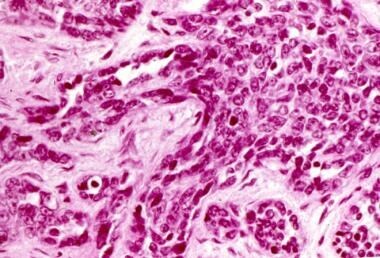 Although this tumor is also known as a hemangiosarcoma, hemangioendothelial sarcoma, and malignant hemangioendothelioma, these secondary terms should be avoided to prevent confusion with epithelioid hemangioendothelioma, which is a separate entity. Angiosarcomas of bone are very rare and account for less than 1% of all angiosarcomas in any organ and less than 1% of primary bone tumors. [1, 2] Although patients with these tumors range in age from 12 to 74 years, most patients are in their 30s or older; angiosarcomas are generally rare before then. Males are more commonly affected than females in a ratio of approximately 2 to 1. Go to Angiosarcoma for complete information on this topic. Pain is the usual presenting symptom. 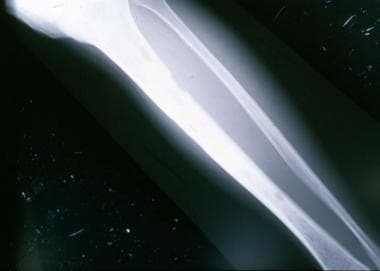 Plain film of the tibia demonstrates small lucencies without internal matrix production in keeping with the diagnosis of a vascular lesion. Coronal T1 magnetic resonance imaging (MRI) study reveals a lesion of the diaphysis with cortical breakthrough. 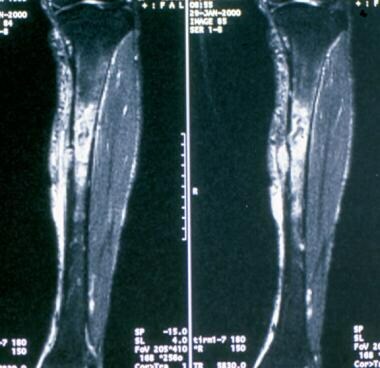 Coronal T2 magnetic resonance image shows a diaphyseal lesion with intense surrounding edema (high signal intensity). Axial T2 magnetic resonance image shows a heterogeneous signal lesion with cortical destruction. The gross appearance of angiosarcoma is that of soft, dark red tissue that may have a spongy consistency (see the image below). Solid gray areas may be interspersed with embedded bone fragments if the cortex has been breached. 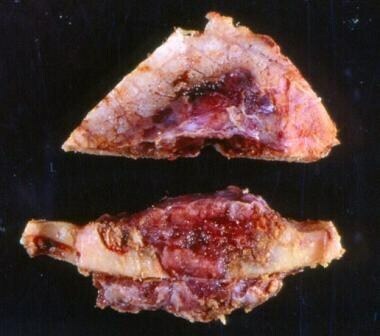 Grossly, angiosarcomas show a reddish-brown color and solid patterns. Foci of angiosarcomas can show well-formed vascular channels that aid in the diagnosis. These channels can be difficult to find in a large number of tumors. 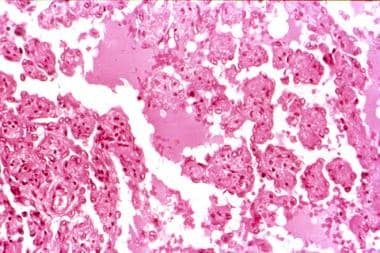 Atypical cells in solid sheets or nests are typical of this tumor and can make diagnosis on hematoxylin and eosin (H&E) sections difficult, necessitating the use of immunohistochemistry. 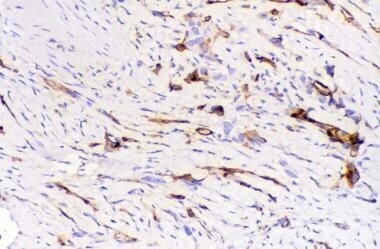 CD34 immunohistochemistry highlights the vascular nature of angiosarcomas and aids in the diagnosis. Sanchez G, Alderete JF. The effect of host adrenalectomy on the physiology of Trypanosoma rhodesiense. Comp Biochem Physiol A Comp Physiol. 1975 Dec 1. 52(4):623-6. [Medline]. Mittal S, Goswami C, Kanoria N, Bhattacharya A. Post-irradiation angiosarcoma of bone. J Cancer Res Ther. 2007 Apr-Jun. 3(2):96-9. [Medline]. Murphey MD, Fairbairn KJ, Parman LM, Baxter KG, Parsa MB, Smith WS. From the archives of the AFIP. Musculoskeletal angiomatous lesions: radiologic-pathologic correlation. Radiographics. 1995 Jul. 15(4):893-917. [Medline]. Scholsem M, Raket D, Flandroy P, Sciot R, Deprez M. Primary temporal bone angiosarcoma: a case report. J Neurooncol. 2005 Nov. 75(2):121-5. [Medline]. Kakouri E, Whelan JS, Coltart S, Smith ME, Souhami RL. 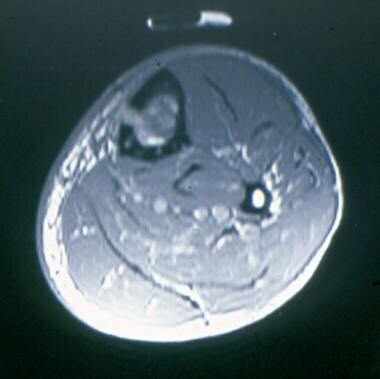 Multi-focal, multi-centric angiosarcoma of bone. 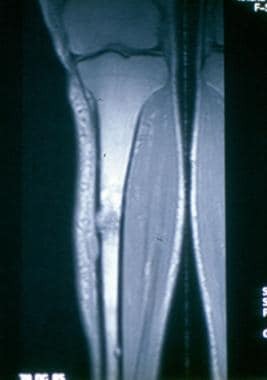 Sarcoma. 1997. 1(3-4):183-7. [Medline]. [Full Text]. Bruder E, Perez-Atayde AR, Jundt G, Alomari AI, Rischewski J, Fishman SJ, et al. Vascular lesions of bone in children, adolescents, and young adults. A clinicopathologic reappraisal and application of the ISSVA classification. Virchows Arch. 2009 Feb. 454(2):161-79. [Medline]. Liu L, Kakiuchi-Kiyota S, Arnold LL, Johansson SL, Wert D, Cohen SM. Pathogenesis of human hemangiosarcomas and hemangiomas. Hum Pathol. 2013 Oct. 44(10):2302-11. [Medline].